Back in 1997, the whole Mongoloids house sound was big on both sides of the Atlantic, with regular exchanges between Basement Jaxx and the big New York names of the time. Looking back, I'm not sure who was emulating who (Sanchez copying Basement Jaxx copying Van Helden and Masters At Work...). 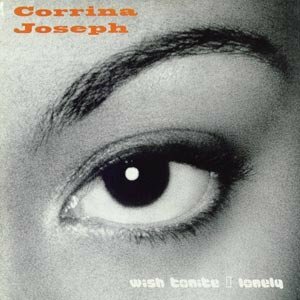 Corrina Joseph was one of the early signings on BJ's Atlantic Jaxx label back in 1997 when the Brixton parties were blowing up and they still had their underground cred. For me that time is long gone, but for a few years the Jaxx boys produced a string of class tracks (and did some cracking remixes) and Corrina Joseph was their muse. Then, after a couple of singles, she disappeared. There were a few dodgy rent-a-voice sightings (notably for Kamasutra in Italy) but for all intents and purposes she had gone. So where did she go? Well, looking at her myspace page it would seem she took some time off from singing in order to have children and enjoy life. Good for her! Though her glory days may be behind her, her classics tracks on Atlantic Jaxx never get old. Like Lonely, with the haunting melody of the main mix perfectly counterpointing the dark ambience and (typical Basement Jaxx) studio trickery of the dub. Obviously, somebody had to splice them together, and that somebody is me. This is superb Jason. Thanks for sharing!